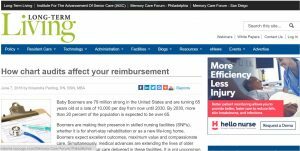 Best-practice chart audits, coupled with best practices in long-term care, can positively affect a Skilled Nursing Facility’s (SNF) ability to achieve maximum reimbursement, as described in this June 7 online article published in Long-Term Living. Written for MedSafe, Krisandra Panting, RN, MBA (Healthcare Consultant and REALTOR®, reviews the latest trends in audits and fraudulent practices. It describes how best long-term care practices (eg, quality review plans, care documentation procedures, regular coding review systems) can proactively help SNFs achieve maximum legal reimbursement legally while avoiding stiff non-compliance penalties. Krisandra Panting, RN, MBA, REALTOR®, began her career in the healthcare industry as a geriatric and home healthcare nurse and, after obtaining an MBA in finance, went on to become the executive director of a home health care agency. Wanting to combine her healthcare expertise with her desire to continue to provide services for adults and seniors with dignity and respect, Krisandra added the additional expertise of licensed REALTOR® to her repertoire, which she has been doing for several years now. Today, Krisandra Panting combines her healthcare and real estate expertise to serve seniors to gracefully transition to new living arrangements in her Parallel 26 company. She also provides healthcare consulting services under the same company. With her boundless energy, get-it-done personality, and expansive knowledge of both geriatric healthcare and real estate, Krisandra continues as well to be a highly active REALTOR® while regularly publishing articles about healthcare and real estate.